Chest Pockets:Spacious chest pockets, one with flap and closure. Plenty of space for pens and pencil. 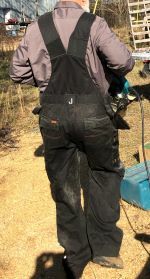 JOBMAN's comfortable NEW Dungarees. These dungarees have an abundance of pockets and features. The 3730 Dungarees has internal kneepad insert pockets with two levels for increased comfort and protection for your knees. The zipper on the front opens from the top or the bottom. There is a phone pocket with a closable flap on chest and also on the left leg. These dungarees are made of Easy-care polyester/cotton that holds its color and shape. Spacious chest pockets with flap and Velcro® closure on the top one. The wide shoulder straps have an elasticated section. Front holster pockets with an extra compartment and extra zip pocket. The large back pockets with flap and Velcro® closure. 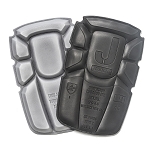 The left leg pocket has an extra compartment and flap with Velcro® closure.